2 Comments on "Just one wish… HOME – Spike"
Spike has a spinal problem that causes him to have limited use of his rear legs (drag) and some incontinence. It may progress in time and he may need a wheelchair at some point in his life. Spike also is partially deaf and blind – although he navigates his walks in the yard and around the home perfectly! Spike requires eye drops and a few medications to help him deal with his disk/leg pain. 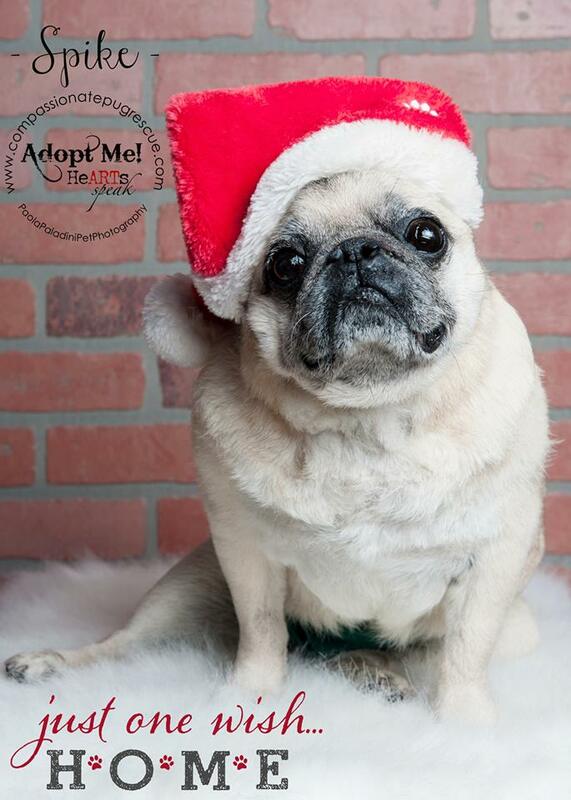 He is a happy and playful senior pug and gets along well with other dogs and children. If you are interested in possibly adopting Spike or any other pug from Compassionate Pug Rescue, please complete our Adoption Application to get the process started. Thank you for considering pug rescue!